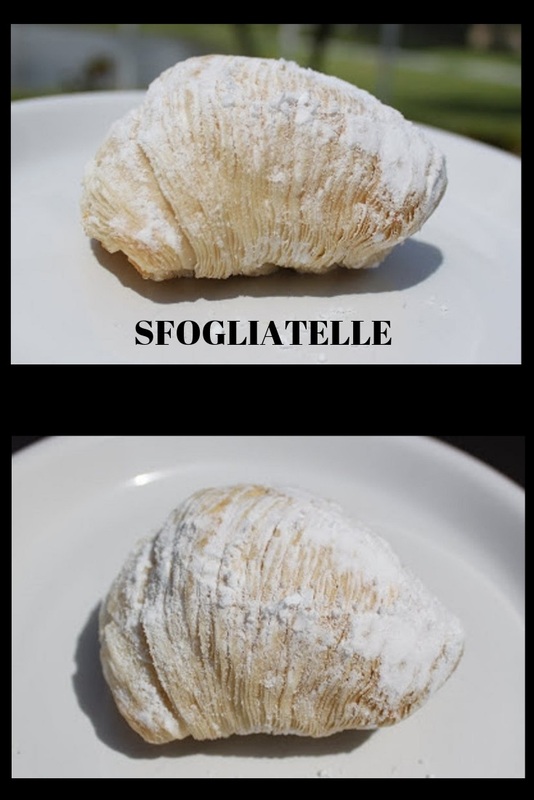 These wonderful Sfogliatella Italian Pastries are usually made around Easter time in our family. These pastries are a bit time consuming but the taste but the results were fabulous. A flaky dough that looks like clam shells. Takes a little more practice, while making these to get them right! I have to say out of the 30 pastries only one was worthy enough for a photo! Scroll down for this recipe. A sfogliatella, sometimes called a lobster tail in English, is a shell-shaped filled Italian pastry native to Campania. Sfogliatella means "small, thin leaf/layer", as the pastry's texture resembles stacked leaves. I English it means lobster tail because of its shape. American lobster tails are filled with a sweet cream much more like a frosting or whipped cream not custard, not to be confused with this Italian made pastry. If you have visited the Campania region, then you must have encountered this curious-looking puff pastry called sfogliatelle. And yep, that’s not a typo, no matter how the spellcheck may tell you otherwise. That is really how it’s spelled. As for how you pronounce it, you read it as sfol-ya-tel-le. It’s a puff pastry that has about the same texture as a croissant. But its shape is that of a shell or a lobster tail. And it can hold all kinds of yummy filling, such as a simple whipped cream or a special custard mixture with candied peels. Others even have almond paste as filling instead of creamy custard. Sfogliatella is a symbol of the city of Naples. The story goes that a nun in a convent somewhere in the Amalfi coast combined some leftover semolina with lemon liqueur, sugar, and dried fruit. Then she took some dough and kneaded them into two sheets, and put the semolina mixture in the center, serving as filling. And this sweet pastry is called Santarosa, which is a sweet treat still very much popular in Italy today. It was named after the convent of Santa Rosa, where the first nuns who created it lived. Later in the 19th century, the pastry made its way to the city of Naples. There, a pastry shop owner named Pasquale Pintauro changed its shape into the triangular lobster tail that it is today. Melt the honey with water. Put the flour into a food processor and add the shortening, salt and mix until it crumbles. Add the honey/water mixture a little at a time until the dough forms into a ball. Knead the dough until it is smooth and elastic. Wrap and refrigerate for 2 hours. In a heavy-duty, saucepan brings the milk to a boil being careful not to scorch it. Add the salt and pour all the semolina at once in into the water while stirring it rapidly with a wooden spoon. Cook the semolina for 10 minutes then remove it to cool for an hour. Using a wooden spoon mix the ricotta, sugar, oil of cinnamon, orange flower water, if using add candied orange peel, candied citron, and eggs all together in a glass bowl. When the semolina is cool add it to the ricotta cheese mixture and mix smooth. Take out your dough and cut it into 4 equal size pieces. Using (a pasta machine if you have one) make each piece of dough into a very thin long layer 6 inches wide and 18 inches long as thin as you can get it. Or roll by hand as I did getting it as thin as possible. Place a sheet of the thin dough on top of a parchment paper tray on a large hard surface like a huge cutting board or pasta board. Brush the sheeted dough with the melted butter or lard coating it completely. Place another piece of sheeted dough on top of the one you just brushed with butter and repeat. Do this until all the dough is layered and sheeted. Trim the pastry now so it is a long rectangle. Starting from the small 6-inch end tightly roll the stack of pastry into a tight single roll its edges should look like a rolled up like a newspaper roll. It is important to refrigerate the pastry now wrapped in a cotton dishtowel (to absorb moisture ) for at least 4 hours. Take out your chilled pastry and slice a 1/2 inch slice this will looks ribbon. Now lift up the circle and place it in the palm of your hand. Using your finger press into the center and begin pushing the layers out as if you were creating a hollow" A" frame house, and fanning until you have a layered cone effect. After you make this pastry cup hold the shell in the center of your hand, put a spoon full of filling inside the center, sealing the edges, but don’t pinch them together. Carefully lay them down on your parchment-lined baking sheet. Brush each one with an egg wash or melted butter, suet or lard whatever you choose to use. Bake @375 degrees for 15 minutes until light and golden in color. Sprinkle them with powdered sugar when they are hot out of the oven, and serve them warm if possible. These are a delicious Italian pastry, it takes time and practice but they taste marvelous homemade! These look fantastic! I love the picture of your taste-tester/supervisor... my kitties love to "help" too! OMG you are good. Bet they were awesome regardless of how photogenic they were. My grandma used to make them. I don't recall candied fruits in the filling. I'll bet that using lard would have made a difference. I think she used either lard or shortening. They say practice makes perfect so I'm sure the next time they will be easier to make :) This is the first time I hear about sfogliatelle, love the name and even though the pastries seem to be hard to make and time consuming, those flakes are totally worth it! Claudia...my Mom would love to have you as her daughter right now...this is her favorite pastry. Yes, I remember seeing Patricia's post on this very time consuming treat. Bravo for you that you pulled up those sleeves to confront such a challenge. My dear, I've said this before...where do you squeeze in the time to take on such challenges? Yeah!!!! My husband and I feel in love with these delicious pastries on our honeymoon and I haven't had one since! Thanks so much for the recipe! I want to try these, I think also this would be a fun project with my daughter. Thanks Claudia. I love the look and sound of that Sfogliatelle. Wonder if it will pop up in the Taste of Utica book? Yum! I used to buy these all the time at the Italian bakery. I always said they reminded me of clam shells...hehe. Wow, this looks amazing. I've never seen orange flower water. I'll be on the lookout! One summer I lived in Rome about a block from a bakery and would wake up before dawn to the smell of these. I ate many of them that summer. Thanks for the memory! That is so beautiful! I have never heard of this! I've never heard of this dessert and it sounds delicious, love that filling! And your fur buddy is pretty awesome too! Brava to you for attempting this difficult pastry! Your lone soldier is a beauty and so is your kitty. :)) Cheers! Claudia, you are my hero! This is my favorite Italian pastry, but I have never had the nerve to attempt them. You did a fabulous job. I'm bookmarking this, just in case I work up the nerve. Your kitty is gorgeous! And the pastry delectable! I don't remember ever having them before. Kitty is adorable and look at that look....smell wonderful aroma in the air. Wow! Simply outstanding. I've only had these from Italain Bakeries. These were one of the desserts served at family gatherings when the family would get together at Easter. Looks like an amazing recipe. I appreciate your honesty Claudia, in that only one was photo worthy..but I bet they were all tasteworthy! I know they were good! Keep up the good work! Amazing! Well your loan soldier looks perfect...and that very handsome kitty will attest to that fact :) I can not even imagine what practice will do here...I may have to move in! awesome presentation..first time visiting your space..
very interesting blog you have..excellent photography..
Just hopping around to the other blogs featured today on La Bella Vita... yours caught my attention in particular because sfogliatelle are my absolute favorite. I'll definitely try your recipe. Thanks for sharing it. How'd I miss this? I have always been too intimidated to make these - consequently I only have one every few years when I go to NYC. You have inspired me - what's the worst that could happen? And the fact that you have one gorgeous lone solder willing to be photographed fills me with hope. Cats in the kitchen - I am convinced it's good luck! My gosh that's alot of work! Hats off to you Claudia, and your picture is mouthwatering. This sounds like my kind of pastry. Wish we could find things like this around here. I was ok with this until the 4 hour wait after a 2 hour wait. This one will require a bit of planning. Can i make the pastry only at night and turn the 4 hour in the fridge into overnight? and make the filling the next morning so can have these for morning tea? I found this delicious recipe pinned on the 'Deliciously Italian' board and it led me back to your post Claudia! I fell in LOVE with these in Napoli! I hope that I can bake them as beautifully as you have done! Buon Natale dear friend!